Many species of flowers emerge under the right conditions in the desert areas of the United States. These plants depend on the correct mix of sunshine, temperature and rain to grow and finally blossom. While the familiar desert plants such as the cactus have their own beautiful flowers, there are many types of wildflowers that have the ability to grow in these harsh lands, adding their colors to the desert landscape. Many of the wildflowers in the desert environment are what botanists term “ephemerals”, which means that they have extremely rapid and short life cycles, growing only when the right scenario occurs. When conditions are right, their seeds will germinate and the plants will quickly spring up, flower, create their seeds and then perish, scattering these seeds about the desert. This ensures the survival of the species. These plants may not show up in an area for years at a time, only to develop in the spring one year when their habitat allows. Certain wildflowers occur only at specific elevations and only in particular regions of the Southwestern deserts. For example, the Mojave aster is a purple wildflower that grows at elevations between 2,000-5,000 feet. It exists in the Sonoran Desert, the Mojave Desert and parts of the Great Basin. Another species, desert lupine, grows at elevations less than 3,000 feet in the Mojave, Sonoran and Chihuahan Deserts. The desert flowers all have subtle differences between them. The desert globemallow for instance has a delicate flower composed of five petals shaped like a cup. They are an inch and a half in width, possess a bright orange hue and this type of desert flower can bloom the entire year. The desert marigold is much like a garden-variety marigold; it can be as tall as 30 inches but has hairy leaves that reflect sunlight, helping keep the temperature of the plant at a bearable level. Although many people think that a cactus is simply a thick plant full of sharp spines, these desert specimens have some of the most spectacular flowers in the entire Southwest. One case in point is the cholla cactus, a common cactus of the region. 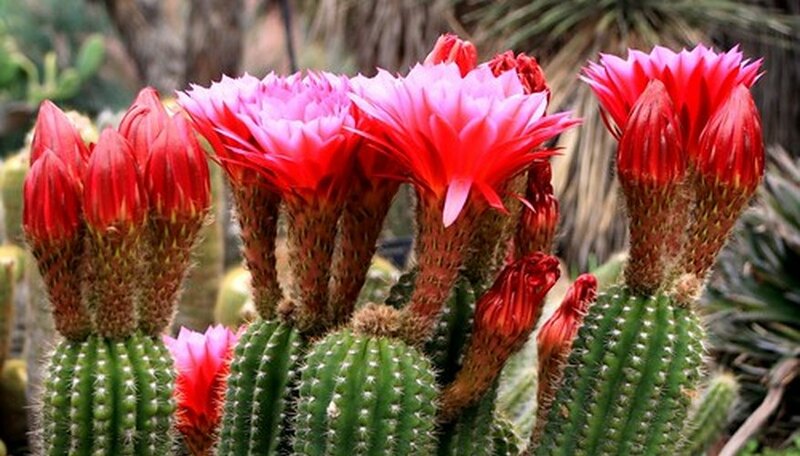 The cactus produces flowers that can have bright red, yellow, pink, orange and lavender petals. These flowers in time develop into fruits, many that contain a spiny covering, which hold the seeds of the cactus.